Fans will get new apps for Xbox One and Windows 10, while football coaches get new Surface Pro 3 tablets. With the start of the U.S. professional football season around the corner, Microsoft unveiled the new tech it’s going to be providing coaches and fans this season as part of its ongoing partnership with the National Football League. 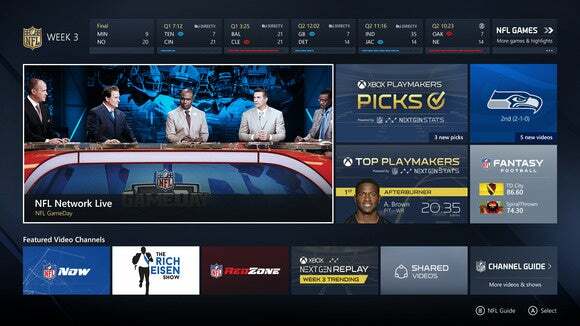 The Xbox One app is designed to be a command center that fans can open up to get information about their favorite teams, fantasy leagues and all things NFL right from their couch. It’s an update to the app Microsoft released last year that provided fans with videos from their favorite teams, information about their fantasy teams and access to live video from the NFL if they pay for the right TV channels. Starting this year, users can now pick out two favorite teams instead of one, so they can easily follow their hometown favorites along with a local franchise. Those stats also power a new “NGS Pick’em” game that lets Xbox owners predict the performance of football players and win prizes for guessing correctly. One overall “Pick’em” winner from the entire season will get tickets to Super Bowl 50, and other prizes will be available on a week-by-week basis. While Microsoft has been emphasizing the Xbox One app, Windows 10 users will also have access to an app that features much of the Xbox app’s functionality. Todd Stevens, an executive producer at Microsoft, said that the Windows 10 app makes PCs and tablets running the company’s new operating system “the ultimate companion” for NFL fans watching games on their television. “I can keep the game in full screen [on my television], meanwhile, as every highlight comes in, I can be watching this right on my Windows 10 device,” he said. The new Surface Pro 3 tablets that coaches will be using on the sidelines feature larger screens compared to the Surface Pro 2s that Microsoft handed out last year, while simultaneously becoming thinner and lighter than their predecessors. They’re still wrapped in a special case and are protected from extreme heat, water and drops. Like its predecessor, that case includes a hand strap so coaches have an easier time using it while standing with their players; it also features a leash for the Surface Pen stylus so it’s at hand. Microsoft’s new tablets have been upgraded with a new version of the Sideline Viewing System, which was introduced last season and shows photos of the play both before and after the snap so players and coaches can review their opponents’ formations and figure out how to modify their tactics for future plays. Surface-wielders can now draw on the images in multiple different colors, and the larger screen size of the Surface Pro 3 offers greater real estate for reviewing plays. Microsoft also added a whiteboard feature that lets users free-hand draw diagrams on the screen as though they were sketching on a physical whiteboard. In addition, coaches will be testing the use of video replay on those tablets during 21 preseason games, in order to evaluate whether it would be appropriate to roll out that technology to the sidelines in future seasons. Referees will also get in on the Surface action during those games by using Microsoft’s tablets to review replays rather than using a video review station on the sidelines. But despite the league’s controversies, Microsoft is still all in on its partnership, said Jeff Tran, Microsoft’s director of sports and alliances.